I am looking for a method to say know what it the value of Y for a given value of X. I am specially interested in understanding what is the value of Y for X = 50. Could you please help me how to fit a curve and in R? 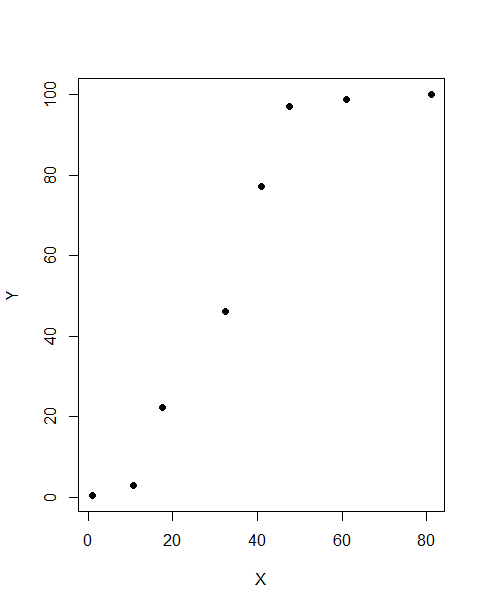 How to do it in R is off-topic here, but if R is half as good as they say you should have no difficulty finding implementations. To do the interpolation I added a grid at $x =$ 1(1)80. The latter predicts 93.12383 at $x =$ 50. 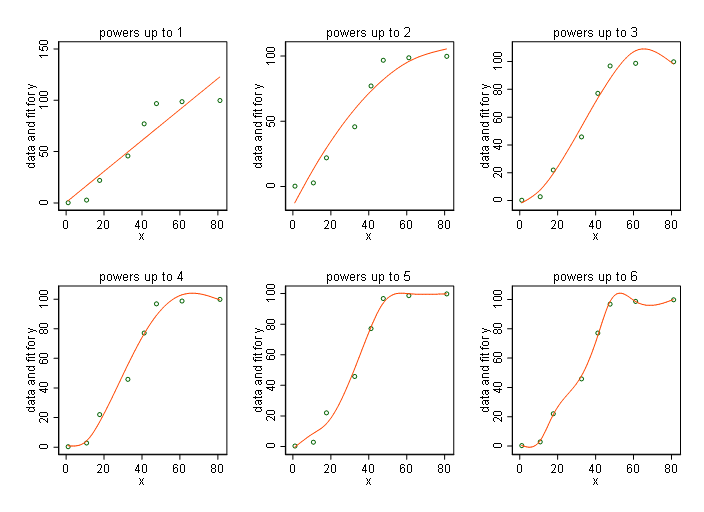 The polynomials show the usual sad progression from underfitting to overfitting. What extra spin the logistic may deserve from relevance to underlying process I can't say. 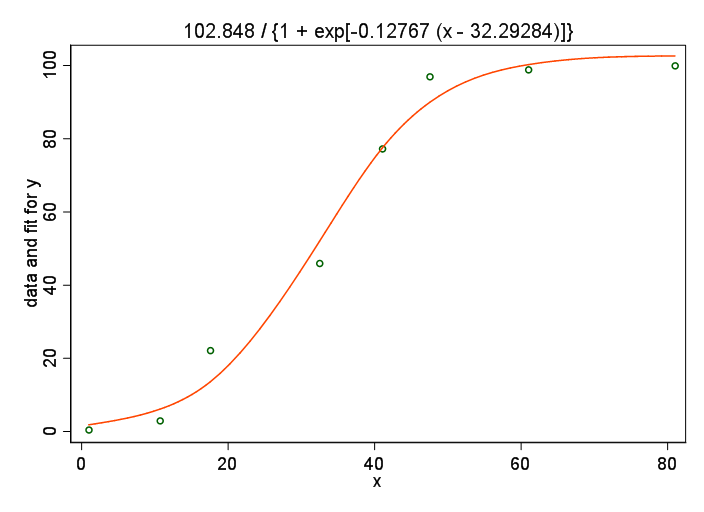 There might be a case for taking 100 as known upper limit and leaving only two parameters to estimate. The fitting to a linear piecewise function might be sufficient to model your experiment. The figure below shows the result of fitting a three segments piecewise function to your data. The computed values of the parameters $a_1 , a_2 , p_1 , q_1 , p_2 , q_2 , p_3 , q_3 $ are shown on the figure. The logistic equation found by Nick Cox leads to $x=31.86$ which is close (difference = $0.84$). On a statistical viewpoint, the logistic model might be more significant that the piecewise model. So, one could prefer the logistic model, even if the regression for fitting is more complicated than with the piecewise model. Not the answer you're looking for? 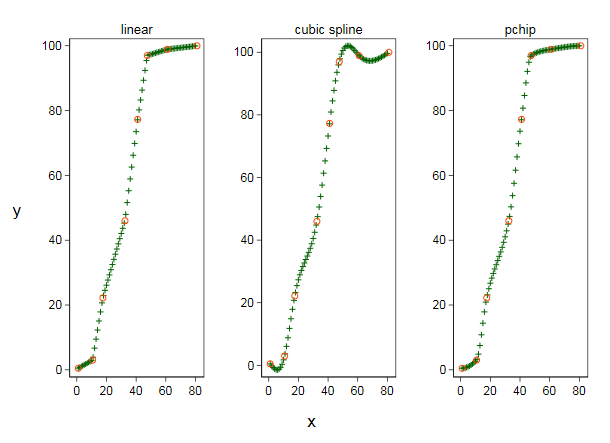 Browse other questions tagged r regression curve-fitting splines or ask your own question.